Welcome to the World Famous Crochet Museum. 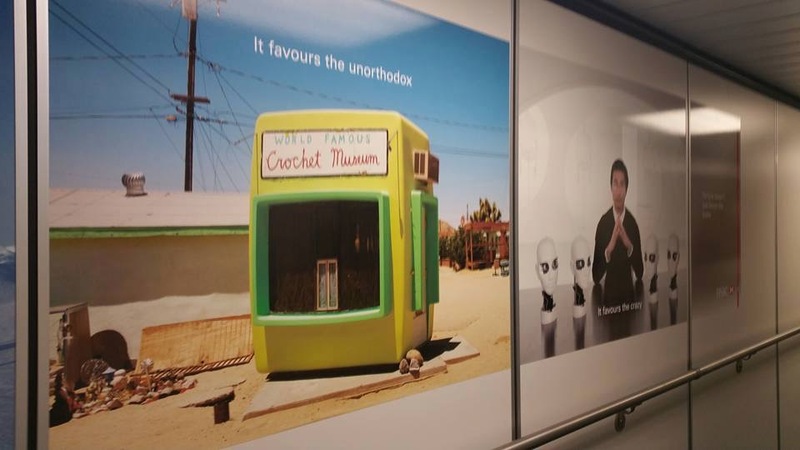 The World Famous Crochet Musuem is being spotted in airports all over the world. 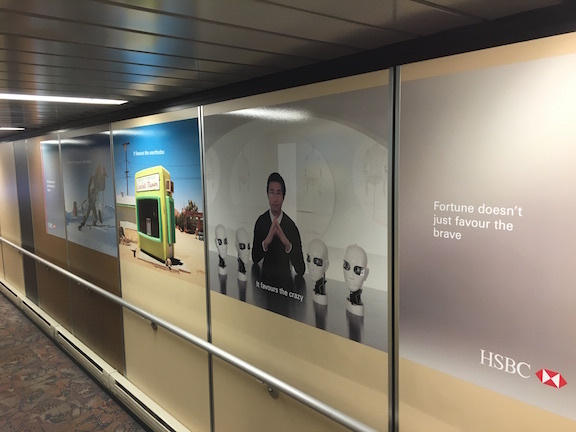 If you see this ad (for HSBC Bank) in an airport or anywhere, please send us a photo! On January 2nd, our friend sent us the shot on the left from the Toronto Pearson International Airport and then my friend Fran Katzman of NY, sent this photo from the Hong Kong International Airport. 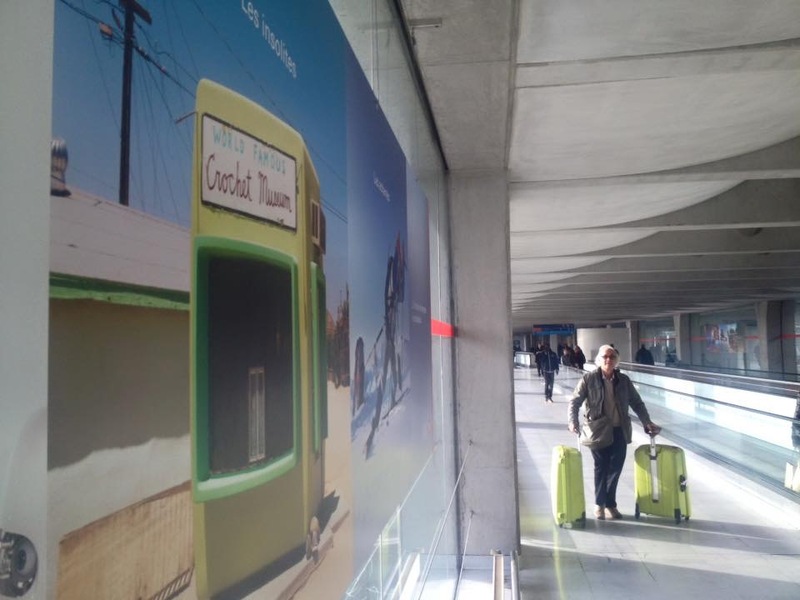 Thank you Frédéric Choffat for this shot (left) of the World Famous Crochet Museum taken at Charles de Gaulle Airport in Paris, France January 27, 2016. And thank you Ryan (Mr.Fab) for snapping this shot in the Calgary Alberta Airport August 16, 2016. 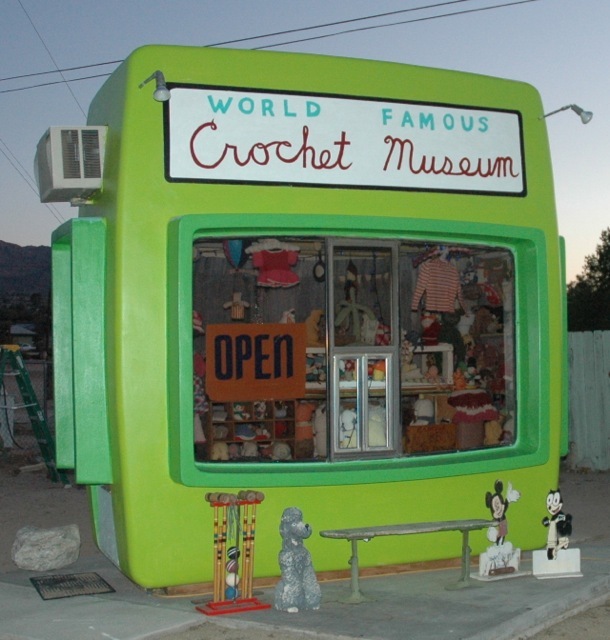 Our Favorite Blogger, Susie Bubble Blogs about the World Famous Crochet Museum! 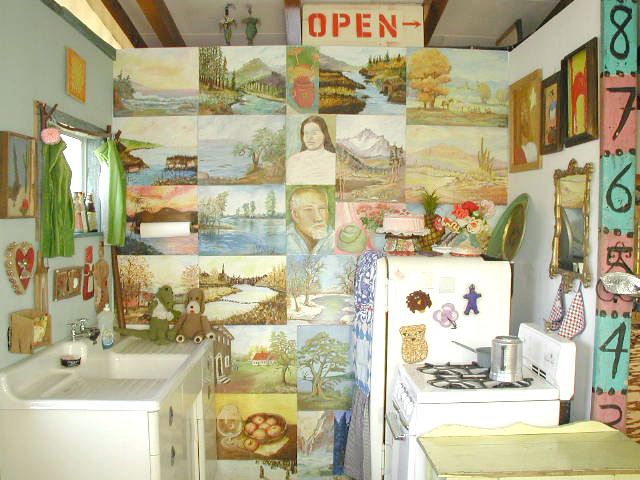 Please come by and visit the World Famous Crochet Museum and Art Queen. We are always open, even though we may not be there and usually do not take appointments. 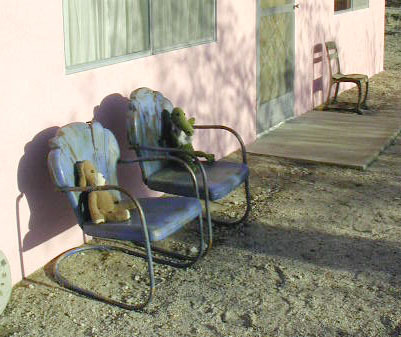 The address is 61855 Highway 62, Joshua Tree, California, just east of the Joshua Tree Saloon. Mark Pritchard posted a few pictures, here is a slide show. Our crochet thanks to Ann Magnuson, Ellen Bloom and Cathy of California for writing such nice things in their blogs! A thousand warm and cozy crochet hugs to you all, we love you! "A crochet umbrella of protection veils me from any unnecessary distractions." Bunny loves hearing from her fans, here she is trying to keep up with all of her recent fan mail activity. Bunny sends a special hello today to our friends who found us from the Talking Crochet Newsletter. Bunny also says Hello and looks forward to the busloads of fans from the Crochet Crowd Facebook page. Here they are playing a game of Yahtzee, Bunny usually wins (she's been known to cheat) but Buddy doesn't seem to care, he likes to make her happy. 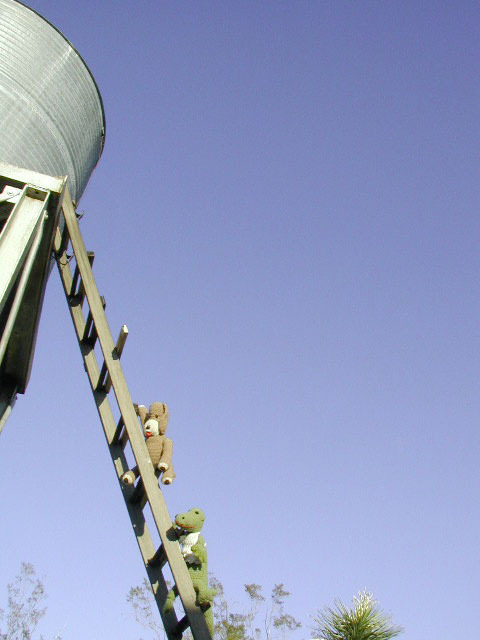 Buddy likes to make sure the water is holding out in the water tank, Bunny likes to go for a swim just like they did in Petticoat Junction. 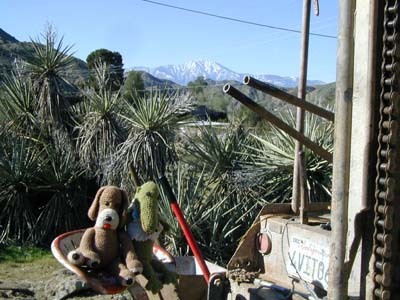 Buddy and Bunny helped the guys at Chambers DP Drilling work the drill for the well at our cabin. The beautiful San Jacinto Mountains are in the background. 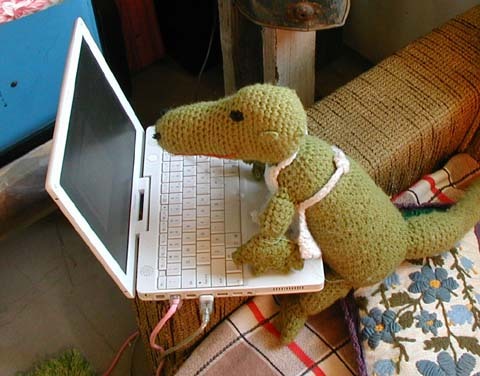 Hi, I'm Bunny, a crochet alligator and your helpful and knowledgeable curator here at The Crochet Museum. To start the tour, please scroll down the page for some views of some of our favorites in the Crochet Museum. If you have any questions, feel free to ask me and by all means, please be sure to visit my new "Bunny's Talk Show" page. Note from Bunny: "Some people think Shari makes these crochet animals, she does not, as she doesn't really know how to knit or crochet (recently we had a lesson with our Art Not Walmart group and Shari learned how to make a long crochet chain, she's pretty happy with this new ability and thanks Suzanne for the lesson. Shari is a big fan of crochet and collects it for the museum. One of these days she hopes to learn how but for now she would like to thank all of the anonymous folks (well, mostly old ladies--you know who you are--and we think you are goddesses who must be worshipped!) who went to all the trouble to make these lovely creations and to make the Crochet Museum possible. 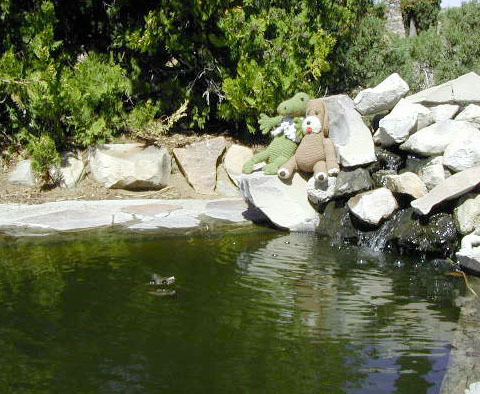 Buddy and Bunny like to hang out and enjoy their time affluence most of the time. One of their other favorite things to do is eat crochet Oreos. Welcome to the Crochet Museum! Crochet Oreo cookie as recently seen in Bunny and Buddy's debut video "Want a Danish." Cat note pad, what a helpful cat! Two nice poodles crocheted over bottles. We're wondering if Crochet Poodle Bottle covers were just a clever way for grandma to hide the liquor? 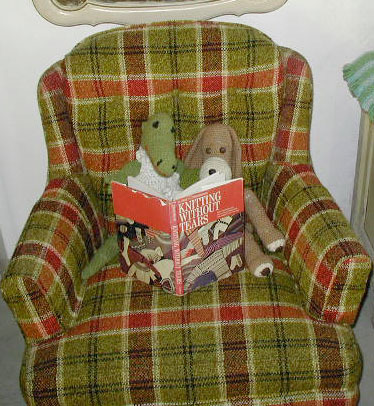 Ha ha, we're not sure but we're glad grandma got the idea for the poodles, more poodles below in the Poodle Wing. Crochet kangaroos, 2 in a row, with their babies. Aren't they the cutest things? And what a charming couple here. Poodles, that one on the right is from our friend Doug Newman, it's filled with golf balls! Bunny calls this the Poodle Wing. 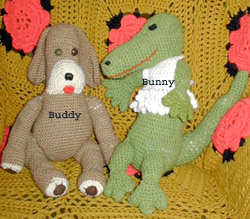 These Poodles are also in a choir that will appear in Bunny's new self titled music video "Bunny". Well, that's the tour for today. We here at the Crochet Museum thank you for stopping by. 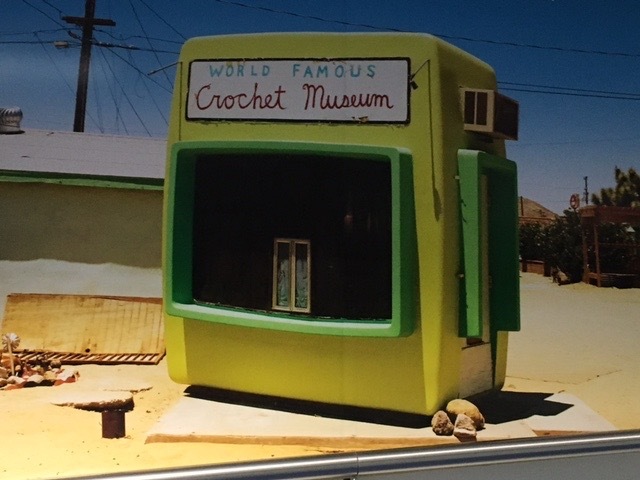 Please come back soon, or sign up on our Crochet Museum email list to hear any kind of news that a crochet museum could have. If you want to be on this list, it is also Shari's collective email list that also includes Art Queen events and emails when Shari puts new art on her website. She actually can't remember if she's ever sent a note specifically about the Crochet Museum. She likes to be off line as much as possible these days.